If you are long time readers you know that we always advocate more storage, fast storage, and redundancy of storage. We have covered a LOT of external and internal drives of varying capacity, speeds, and interfaces over the years. The need for storage hasn’t decreased. Instead it has bloomed as we predicted and started to migrate to online sources. For those not quite comfortable with storing their data online where hackers and other companies alike can access your personal files there remains one solution. Get your own drives for your data. This means some form of storage you can take with you. Rocstor makes solutions that address exactly this kind of need. 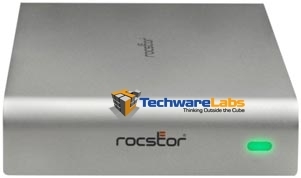 We have here today the Rocstor ROCPRO 900e Desktop Portable External Hard Drive. As you might expect this drive provides additional storage to a desktop or laptop and is portable (more on that later). What’s different you ask. Well the ROCPRO 900e comes with just about every type of connectivity you would want. This makes the drive ultra useful and versatile. I cannot stress enough the usefulness of multiple connectivity interfaces. 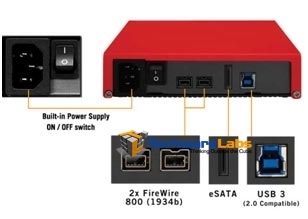 The ROCPRO 900e comes with USB 2.0/3.0, FIREWIRE, and eSATA connectors and Rocstor has included the cables for each of these connections in the box. As we mentioned above the Rocstor ROCPRO 900e comes with multiple connection options. The chart above demonstrates the connections available and their associated transfer speeds supported below.